Knowing where you rank in popularity on the Internet has become quite a valuable commodity. It seems money really can buy you influence. Customer engagement service Lithium Technologies on Tuesday agreed to buy Klout, a service that measures users' online influence. While the papers have been signed, the deal has yet to close, according to a source close to the negotiations. The deal is worth at least $100 million, according to Recode, which initially reported the story. The majority of the deal was in stock, the source told CNNMoney. Lithium Technologies is expected to go public this year and approached Klout about merging. 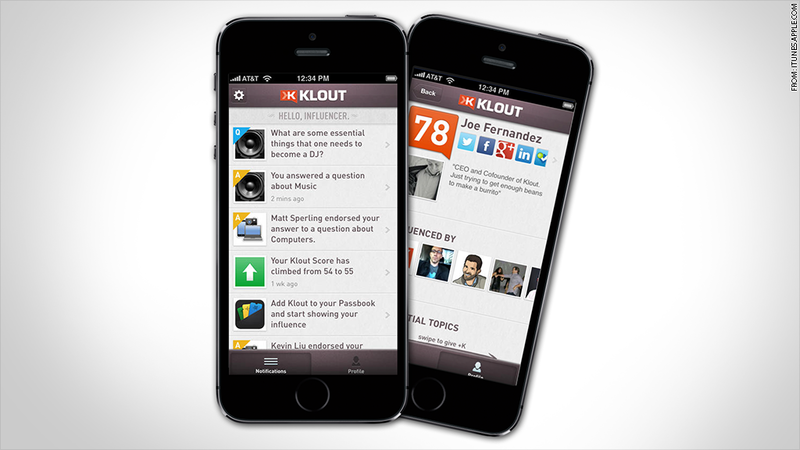 Klout, which launched in 2010, ranks users' social influence by using social media analytics. The service measures multiple variables, from the number of times users' tweets are retweeted to the size and influence of their followers in order to assign a numerical "Klout Score." The company is funded by a roster of investors including Kleiner Perkins Caufield & Byers, Venrock, Institutional Venture Partners, and Greycroft. Klout initially launched as social networks were gaining traction, and it was one of the few services in the now crowded field of companies creating mechanisms for measuring social influence. The company, which once shared an office building with Twitter, was the brainchild of entrepreneur Joe Fernandez. The entrepreneur came up with the idea for a service that measured social network communications after being forced to rely on Twitter and Facebook to communicate following surgery that left his jaw wired shut for months.